As we begin today, I’d like you to do a few things. First, identify someone who will be your listening partner for a few minutes. And I truly mean “listening” partner – no questions or comments allowed. If you would rather not have a listening partner, that’s absolutely fine, too. And, after hearing the questions, you can change your mind, no problem. If you need to move to be close enough, please do so now. Secondly, take a moment or two now, to settle in, to simply be in this moment right here and now. Close your eyes if that helps. Let go of the many distractions, worries, the plans for the Broncos game after church, whatever, and just be right here. Take some deep cleansing breaths; inhale and exhale, and become present to yourself, to the Spirit, to this moment. Thirdly, in this stillness, silently consider two big questions for about a minute or so. You might want to take another big breath or two. Here are the two questions: What experience caused you to look your own death square in the eyes? How did you feel and what did you learn? The first question is simply to identify the experience, but don’t spend much time there. The second question is where the heart is – how did you feel and what did you learn? Before we go into the silence – and before you want to run me out of the church! – I want to remind you of a constant theme of Jesus. If anyone would come after me, let him deny himself and take up his cross daily and follow me. Truly, truly, I say to you, unless a grain of wheat falls into the earth and dies, it remains alone; but if it dies, it bears much fruit. And whoever does not take up his cross and follow me is not worthy of me. These texts can be read in different ways, but one of the most common ways to interpret them is to realize that yes we will die, and turning to face our death is a source of great wisdom for us. But we often do the exact opposite. We deny the reality of our death, and avoid it as much as possible. One of the most profound books I’ve ever read is, The Denial of Death, by Ernst Becker. So return to that centered place, now, and enter into the silence for a minute or so. This has been a difficult 2 months for me. I am driving back from a beautiful day in RMNP, 15 minutes from home, and the next thing I know I wake up in an ambulance talking to paramedics. In the next 3 days, I undergo all kinds of scans, and I hear words like Lymphoma, cancer, tumors, seizures, and my life suddenly, radically changes. I am not free to drive. My beloved Jeep, with nearly 400,000 miles on it, to it I had to say “thank you” and “goodbye.” I still look out the window at my parking space and feel a shock that the Jeep is not there. But here it is: in whatever happens to us, there, somewhere, somehow, someway, is God’s presence, love, hope, and even joy. I was mad. Why me? And I kept asking that question for 3 or 4 days. I felt like the Psalmist lashing out at God at the injustice of it all. But then I took a step back, but that doesn’t quite describe what happened. Rather, I found myself taking a step back. The stepping back came as gift, as a sudden “Aha” moment that took me by surprise. And in that place of gift, I realized how blessed I have been for so many years with good health. Every once in a while my lower back will tweak, but over the past 40 years I have been able to run, work out, hike, mountain bike, do yoga, and ski the double black diamond runs on deep powder days. So blessed! And in contrast, how many others have suffered incurable diseases, poverty, catastrophe, injustice? Little Elijah, not quite 2 years old, suffering with cancer. Edna Sheldon, 94 years old, lost a son when he was 24, takes care daily of a 60-year-old son, and lost her husband 8 years ago. Why me?? Why not me?! And then I began to see how blessed I was even in my accident! It only involved me, no other car was involved. My Jeep didn’t roll over or smash directly into the wall, I grazed it from the side. It could have been a horrible accident involving the injury or death of others, but it turned out to only be a broken nose, facial bruising, ten stitches, and a concussion. Sue Monk Kidd writes, “Delight can become a way of life, a way of journeying. There’s a saying, ‘Religion is not to be believed, but danced.’” I like this idea, for it shifts the emphasis from our endless pursuit of religious knowledge back to the dimension of living our religion in such a way that it becomes a dance, a celebration in which we open our arms and say yes to life.” When the Heart Waits, p. 185. This is a tough sermon for me because I don’t want to water down human suffering, nor do I think God sends tragedies to us directly. 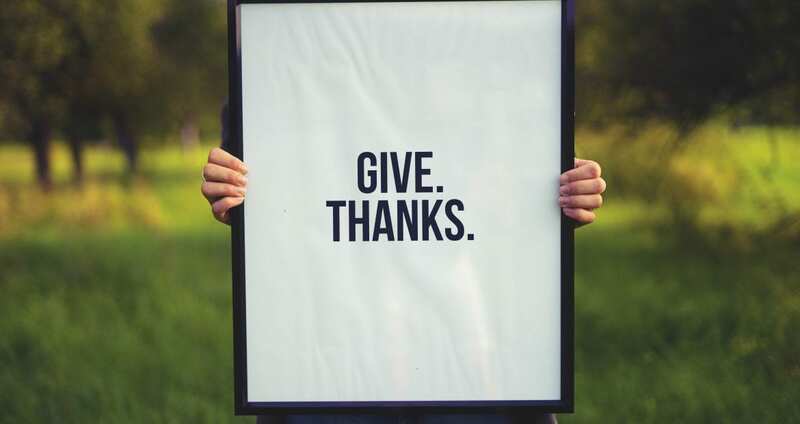 I don’t want to say you can get to that gratitude if you just try hard enough, and getting there can take a long time, and for some of us we don’t ever seem to get there. That’s why I love the way this little verse from I Thessalonians is phrased. It does not say, “For all things give thanks.” It says, “In all things give thanks.” I guess this is maybe what I want to say. And I don’t say it without some doubt and fear. But here it is: in whatever happens to us, there, somewhere, somehow, someway, is God’s presence, love, hope, and even joy. And part of what gives me a great deal of hope is that there are so many stories of people down through history who have not discovered this, achieved this, or found this on their own. This presence, love, hope, joy finds them, unexpectedly in the oddest of moments, and surprises, pardon my French, the heck out of them. It finds us. It is this gift quality that sets it apart, and often brings tears to the soul, because there is just a deep down knowing that this presence, love, hope, joy is real. More real than the harrowing pain, loss, grief, and anger. And it has to come as gift, otherwise we won’t believe it. Alan Jones in his book, Soul Making, puts it this way: “The hardest part of moving into mature believing is to allow oneself to be the object of God’s delight.” P. 145. We are all neurotic and trapped in our own little realities and despite any negative attribute we might attach to ourselves, we are loved by God, and it is most often in facing those things about ourselves and seeing ourselves truthfully, that we are surprised by the presence of God’s love. I continue to have bad days, I still don’t know what’s wrong. But when I land in gratitude, despite all the other stuff, I discover I am well.